Welcome! As an SLP I am asked all the time about articulation development. Should my 4 year old be saying his /r/ yet? Is it normal for my 3 year old to say “lellow?” Today I am going to talk all about your child’s articulation development and go over what is normal and what isn’t. When do children begin to develop their articulation and phonological (aka speech) skills? 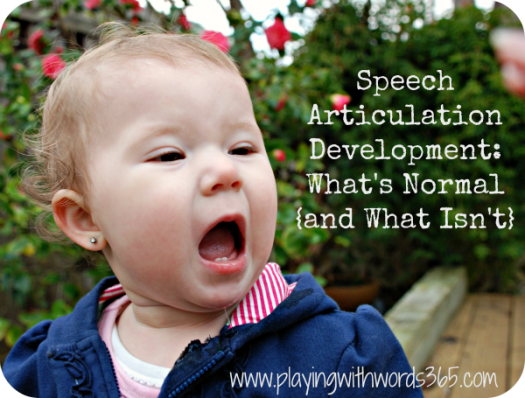 What is “normal” articulation development? When should my child have mastered the production of all the speech sounds? 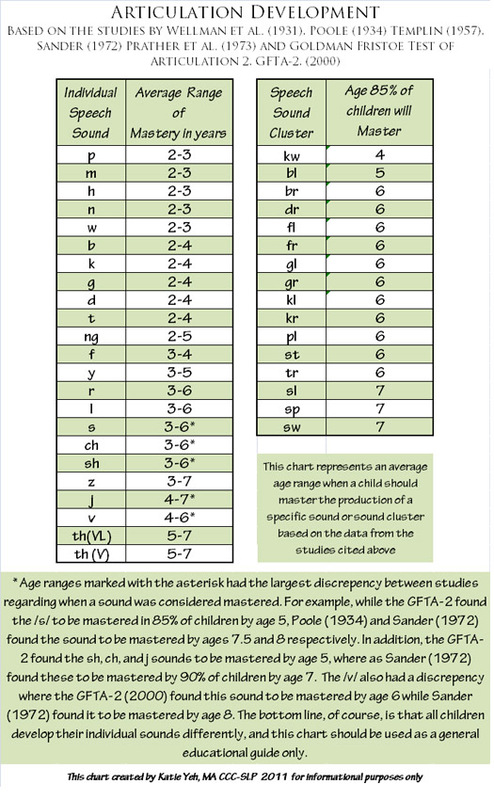 There have been many studies on this and as a result, there are actually several different sets of “speech sound acquisition norms” (go ahead and Google….you will find MANY different charts out there!) Some of the most well known studies include Sander (1972), Prather, Hedrick, & Kern (1975), Templin (1957), Smit et al. (1990) and Goldman-Fristoe Test of Articulation (2000). Each of the studies had slightly different results, which really just tells us that there can be a pretty wide range of “normal” in regards to when your child will master the production of the different sounds, and that we don’t really know for sure when sounds should be 100% mastered. That said, these sets of norms can be helpful to decide if a child will need speech therapy to correct a sound. Here is a chart I created based on the following six studies on speech sound acquisition: Wellman et al. (1931), Poole (1934) Templin (1957), Sander (1972) Prather et al. (1973) and Goldman Fristoe Test of Articulation 2, GFTA-2, (2000). Here is the most widely used set of norms used by SLP’s in the US, based on the research paper by Sander 1972. One thing we do know, is that there is not a strict developmental hierarchy, per say, when it comes to the individual sounds. What I mean is…that all kids don’t necessarily earn the /p/ and then the /m/ and then the /h/. The order in which a child can learn to produce the different sounds in English can vary. However, some researchers including Shriberg (1993), did find that there is somewhat of a developmental sequence to when children master speech sound productions. He referred to them as the Early 8, Middle 8 and Late 8 (EML). As you can see, if your child is say… two or three years old.. we wouldn’t expect him to be able to accurately produce the /r/ sound, for example. Usually, children produce the /w/ for the /r/ as in “wabbit” for rabbit or “gween” for green when they are toddlers and preschoolers. For an /r/ at the end of the word, a young child may simply leave the sound off like “ca” for car or he may attempt to produce it but the the sound is a little distorted. These types of age appropriate errors are referred to as developmental errors. This just means, they are normal, age appropriate errors and they do not require speech therapy. There is an exception to this rule, however, if the child’s errors are actually a result of a phonological delay rather than an articulation delay. I’ll be explaining this in my next post. How can I tell if my child is developing his/her articulation skills appropriately? Another thing to remember: A child, as he/she is learning to speak, will have errors in his/her speech. We expect it, and most kids will go on to learn how to accurately produce all the sounds. However, if a child has MANY ERRORS and cannot be understood, especially after the third birthday…it may be a good idea to have your child seen by an SLP. However if you have ANY concerns at all….I encourage you to have your child screened by a speech-language pathologist. Check out the information HERE discussing when you may want to refer to an SLP and check out the info HERE on how to find an SLP. Next up…speech development isn’t just about articulation. It is also about phonology, or the patterns in which our children learn how to use speech. You can read all about phonology HERE. This is such great information!! Thanks again! I would like a copy (pdf or doc) of your articulation and phonological processing charts. Would you please send them to me? Thank you!! Great information to save and reference as I’m working with my kids. What a lot of useful information! I shared this post on my Facebook page as part of the KBN shout out. Such a great resource you are to parents! So very helpful! Already shared some info from your site but there is so many helpful posts…I’m back for more! Thanks! Very nicely stated! I normally use the “commonly” known bar-chart, which I feel needs more explaining. I like your summary chart that lists the ages. Katie, thank you so much for putting this article together. It’s so helpful to parents, like me, who don’t know whether their worries about their kids’ speech are simply a symptom of helicopter parenting! I linked to your article last night on a post on my recent relief on finding out that my 7-year-olds don’t need to return to speech therapy to work on the their /r/s. I’m definitely going to be coming back to check out the rest of your site. If you ever feel like guest posting on the multiples site I write for, we’d love to have you! Speech issues are so common among twins, triplets and more and we parents often feel out of our depth in seeking help. Sadia recently posted..Speech Re-Evaluation: All Is Well! Thank you for sharing this. I was wondering about a child learning another language. Right now we live overseas and my daughter (will be 5 in January) is in national school where she is learning arabic. Will her English pronunciation have any delays or differences? What should I expect? Thanks again and I will share with friends. Could you please explain the /ng/ sound? Is it an initial sound or just an ending sound as in song? Yes, it is the sound at the end of the word song, sing, etc. In American English it is not found in the initial position of words. This article is quite reassuring. My son just turned 22 months on March 27th, and his old daycare teacher use to try and tell me how I should keep an eye out on his speech because he doesn’t repeat words exactly how they’re suppose to be pronounced. She started telling me this when he about 18 months old. He says PLENTY of words, but of course he’s missing some letters sometimes. For instance, his version of “truck” is “kuck.” She really got all concerned because for the word “stop” he literally says it backwards…”pots.” It’s quite hilarious because he does the hand motion and stomps his foot down and says “POTS!” Because she said it more than once, I started to let worry set in which is how I ended up on your blog today. But looking at the chart you provided I feel more than reassured. He’s got the “Early 8’s” down I believe! And maybe one or so of the “Middle 8’s.” Thanks so much for sharing this information! I am a SLP in Salt Lake City and love your website and materials! I especially enjoyed using the activities with “There Was an Old Lady Who Swallowed a Clover”. My students loved them! Can’t Wait to use your Easter ideas with the “…Swallowed a Chick” book. THANK YOU so much for sharing them! 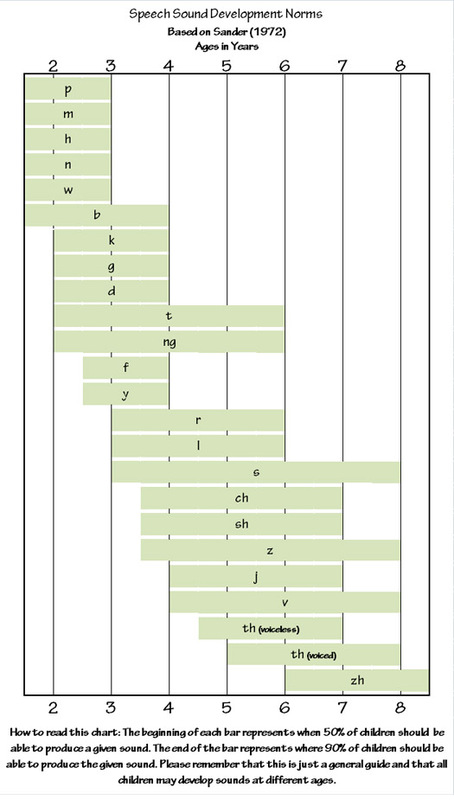 The EarlyMiddleLate8Chart has a mistake (typo) in it — where it says /r/ in the Early 8, that should be /n/. Oh my goodness! You are correct! Thank you! I’ll fix that ASAP. Thanks for letting me know Laura! Thanks for your article. I just finished reading it and found it very helpful. I have a son who will be 6 in October. Where we live he had to be 5 before September 1st to be in kinder so sadly he missed it. He now is kinder although he reads very proficiently & also does math and spelling fairly well. I notice that he pronounces “th” instead of “s” and I am really freaking out about it. The doctor says he’ll be ok but I worry. I don’t want to make him feel bad and need advise on what to do. I will be so grateful on any info you are so kind to give me. Thank you this is an exceptionally helpful site! My grandson has been receiving speech therapy for about 4 months. He is 5 1/4 years old. They have been working on “s” & “z” since Thanksgiving. Progress reports simply say “good job”. Therapist said his troubles were easy to fix & should take 6 months of therapy. He was supposed to move on to “r” but is now still on “s” & “z”. Therapy company wants his to go to OT now too. Why??????? He can say the “s” & “z” sounds correctly when prompted but does not do so in normal, conversational speech. was looking to educate myself more to try and learn more about how to help one of my students, and lookie where i landed! beautiful page, katie — thank you for such clear and knowledgeable advice! How can I encourage my 3 year old to say his “i” sounds? His “i” sounds are spoken with a W or Y sound. Have you had any experience working with SMS – Smith Magenis Syndrome children and their speech difficulties? Hi Mary, no I have not personally. Maybe you an answer a question. My 3 year old is seeing SLP for some help with articulation. She used a really really long word that was very difficult to pronounce to describe something he was doing with his speech and articulation or pronounciation – not too sure what it was or what the word is but know it starts with a D. Any idea what it could be and if so, what it is? I’m becoming a speech pathologist or trying to. Wondering if I can ask you a question related to articulation and the phonological processes.